I suppose I should start right back at the beginning: fifty years ago in November 1959. My father was still in the Army: we'd just returned from a three-year spell out in Hong Kong, and after a brief stay in Dover, we arrived in Leamington. My father took me to an interview with Mr 'Fred' Williamson, the Headmaster of what was to be my new school - incidentally that was one of only two occasions on which I remember having any direct personal contact with him. My mother took me down to Woodwards in The Parade, who were the 'official outfitters' to get me kitted out in my school uniform. In these modern days of exorbitantly priced designer gear, school uniforms are often hailed as great social levellers. Be that as it may, we weren't particularly well-off, and the expense of my green school blazer, school tie, scarf and cap (ugh! ), not to mention assorted items of PE and sports kit, was one I suspect my parents could have well done without. I had to make do with plain grey long socks and pullover rather than ones edged with the school colours, so that they could double up as 'ordinary' clothes at the weekend without my looking too obviously like a schoolboy all the while. 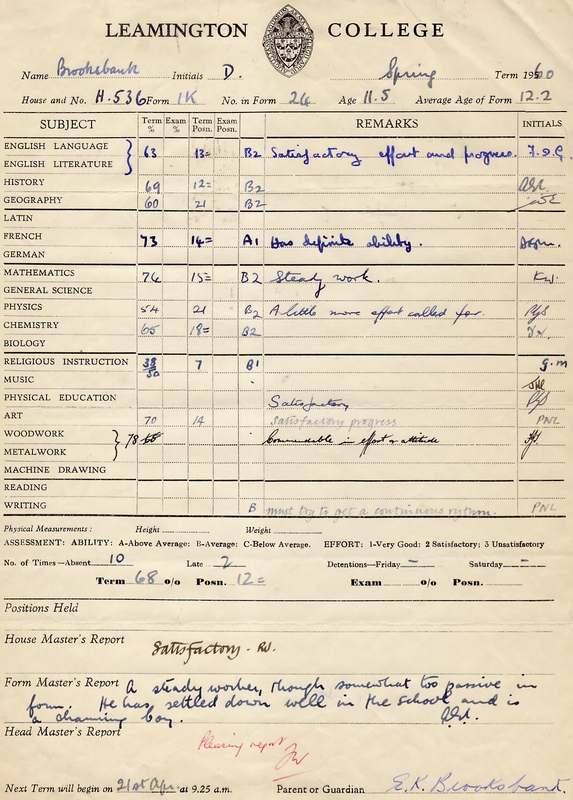 Having been officially enrolled and given my school number (still indelibly marked in my memory now, as well as at the time on all my various pieces of school kit, as H536), I started off in Form 1K - in Room 9 sitting next to Andrew Curtin and with Mr 'Aggy' Clark as Form Master. Throughout my childhood and school life I'd always been extremely timid, shy and slow to make friends, and being the new boy obviously didn't help. 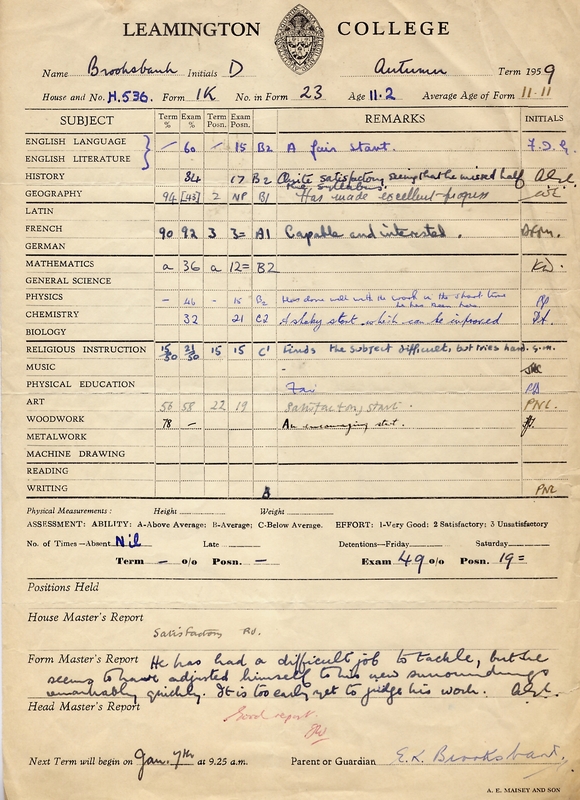 Nevertheless I did my best to fit in: I soon caught up with the work well enough in what remained of that first term, and my First Form reports (I've still kept them all, by the way, filed away in an old tin trunk) had encouraging comments accordingly. 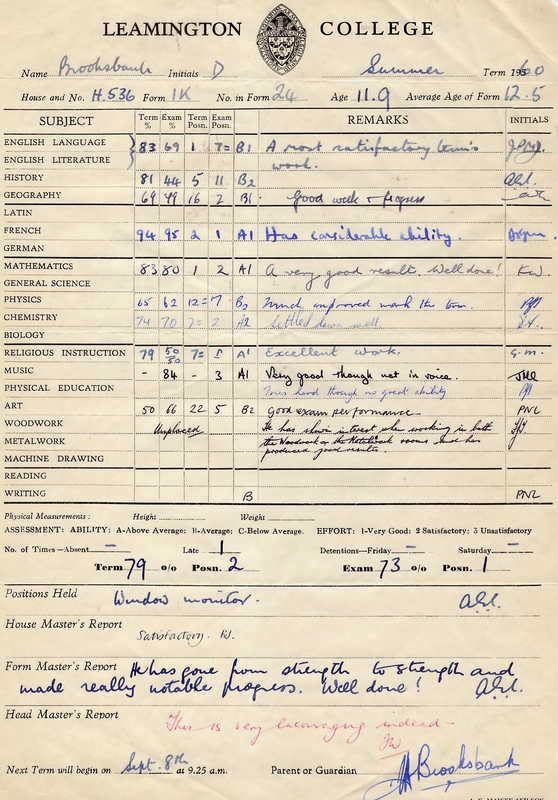 The first year Forms weren't "streamed" (or at least I don't think so), but they were in the rest of the school, and the following year (presumably on the strength of my good marks) I went up to Form 2L - the 'L' denoting that as a Form we all took Latin as a subject.